TIANJIN, CHINA / ACCESSWIRE / August 19, 2015 / China Auto Logistics Inc. (the "Company" or "CALI") (CALI), a top seller in China of luxury imported automobiles and a leading provider of auto-related services, today reported that in its second quarter and first half ended June 30, 2015, the Company continued to experience losses and negative operating cash flows on reduced sales in the continuing slow growth environment in China. Further, a going concern paragraph was again included in the Company's Form 10-Q. The Company noted that key components of the loss in the second quarter and six months ended June 30, 2015 in addition to lower auto sales revenue, were high interest expenses, and depreciation and amortization expenses relating to its acquisition of the Airport International Auto Mall (the "Auto Mall") in Tianjin, which the Company continues to envision as a major element in its future growth plans. Mr. Tong Shiping, Chairman and CEO of the Company stated, "Our main current priorities continue to be maintaining our leadership in imported luxury auto sales despite intense competition, and paying the remaining payments due on our Zhonghe acquisition which includes the Auto Mall in Tianjin. We believe both priorities continue to be achievable and, in our view, will remain the underpinnings for the future growth we envision in the recently created Tianjin Free Trade Zone as China's economy improves." Commenting on the explosions this past week in the Binhai New District in Tianjin, Mr. Tong stated, "CALI has been very fortunate to not experience any damage to its facilities or injuries to its personnel, and we do not currently expect any serious disruption to our business going forward." He added, "Of course, we sincerely lament the loss of life and injuries resulting from this terrible event and extend our heartfelt sympathy to those most affected. Further, we trust every effort is being made to understand its causes and to ensure that something like it does not happen again." The Company reported that the intense competition in its Auto Sales business through the first half of 2015 continued to require providing customers with the lowest possible vehicle prices. Nevertheless, gross margin began to stabilize in the third quarter of 2014 and this trend continued during the first half of 2015. As a result, gross profit on Auto Sales improved during the six months ended June 30, 2015 compared to the same period of 2014, even though Auto Sales revenues decreased. 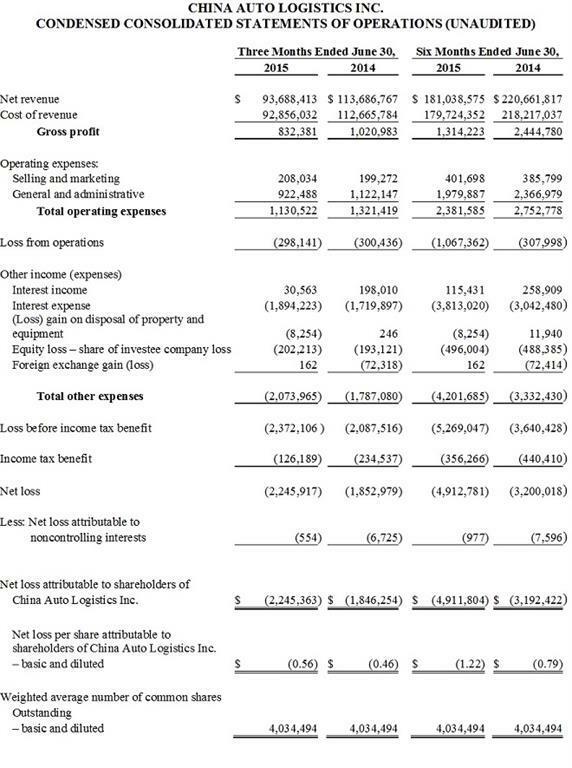 Additionally, despite a reutilization of working capital following the Zhonghe acquisition and the startup of Car King Tianjin, which required the Company to limit the provision of certain popular financing services, the Company was able to generate the highest operating profit in its Financing Services sector among all segments in the first half of 2015, although fee income was lower. In the second quarter and six months ended June 30, 2015, the Company also witnessed significant sales growth at Car King Tianjin, its 40% owned joint venture used car business, although the business remained unprofitable. - Net revenues in the second quarter ended June 30, 2015 declined 17.6% to $93,688,413 from $113,686,767 in the second quarter last year, with Auto Sales comprising 98.3% of sales in the 2015 second quarter and 98.07% in the 2014 second quarter. - Gross profit in the second quarter of 2015 was $832,381 compared with $1,020,983 in the second quarter of 2014. - The loss from operations in the 2015 second quarter was $(298,141) compared with a loss of $(300,436) in the same quarter last year. - EBIDTA (earnings before interest, taxes, depreciation and amortization) in the 2015 second quarter was $100,519, compared with $107,770 in the second quarter of 2014. Interest expense in the second quarter of 2015 was $1,894,223, largely relating to the Zhonghe acquisition and short term borrowings, and depreciation and amortization expense totaled $608,411 in the period. 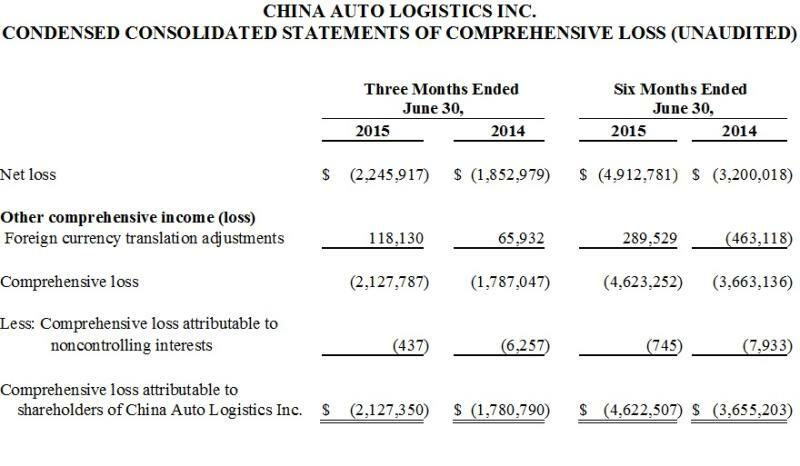 - Auto Sales revenues declined 17.40% year over year to $92,096,247 during the three months ended June 30, 2015. In this period the Company sold 846 automobiles compared with 1,048 automobiles in the second quarter of 2014. In the same time frame, the average selling price per automobile rose from $106,000 to $109,000. - Net revenues from Financing Services decreased 11.86% to $1,580,358 in the second quarter of 2015 from $1,792,924 in the year earlier quarter. However, the gross margin in this business increased to 41.42% compared with 39.04% in the three months ended June 30, 2014. The fee income portion of this business decreased 7.69% year over year in the 2015 second quarter for the reasons described earlier above, while interest income in the quarter was $925,841 compared with $1,083,864 in the 2014 second quarter. As of June 30, 2015, and August 10, 2015 the Company had approximately $184 million in lines of credit to utilize in the Financing Service business. - In the six months ended June 30, 2015 the Company's net revenue was $181,038,575, down 17.96% from the same period a year earlier. - Gross profit in the first six months of 2015 was $1,314,223 which after operating expenses resulted in an operating loss of $(1,067,362). - The net loss attributable to shareholders for the first six months of 2015 was $(4,911,804) or $(1.22) loss per share, compared with $(3,192,422) or $(0.79) loss per share in the first half of 2014. - The major additional expense contributing to the net loss in the first six months of 2015 was interest expense of $3,813,020, primarily relating to the Zhonghe acquisition and short-term borrowings. - With Car King Tianjin still in its early stage and having limited working capital, rental income from Car King Tianjin to the Airport Auto Mall has been deferred. Further, Car King Tianjin continued to incur losses in 2015 through June 30th of $(1,240,0100), despite an increase in sales to $4,540,101, up from $1,451,053 in the six months ended June 30, 2014. 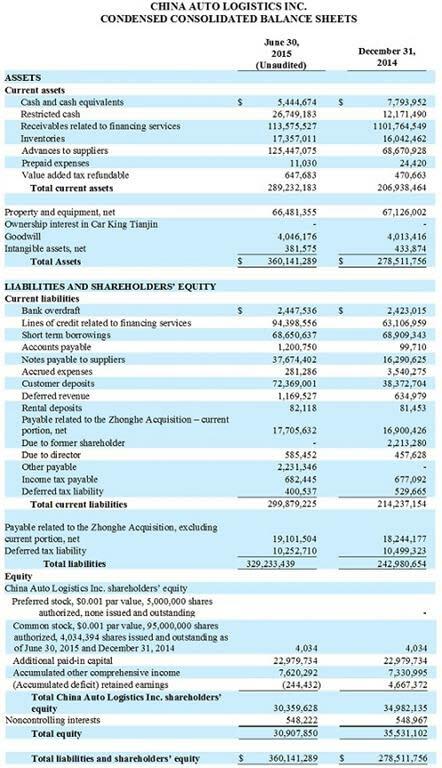 The Company reported an equity loss of $(496,004) related to its investment in Car King Tianjin during the six months ended June 30, 2015, compared to a loss of $(488,385) during the same period of 2014. - EBIDTA for the six months ended June 30, 2015 was a loss of $(344,507) which reflected the interest expense noted above and depreciation and amortization expense in the 2015 first half of $1,225,974. - Cash and cash equivalents as of June 30, 2015 was $5,444,674 compared with $7,793,952 at the beginning of the period and $1,823,512 as of June 30, 2014. - Through the first six months of 2015 the Company had negative operating cash flows. 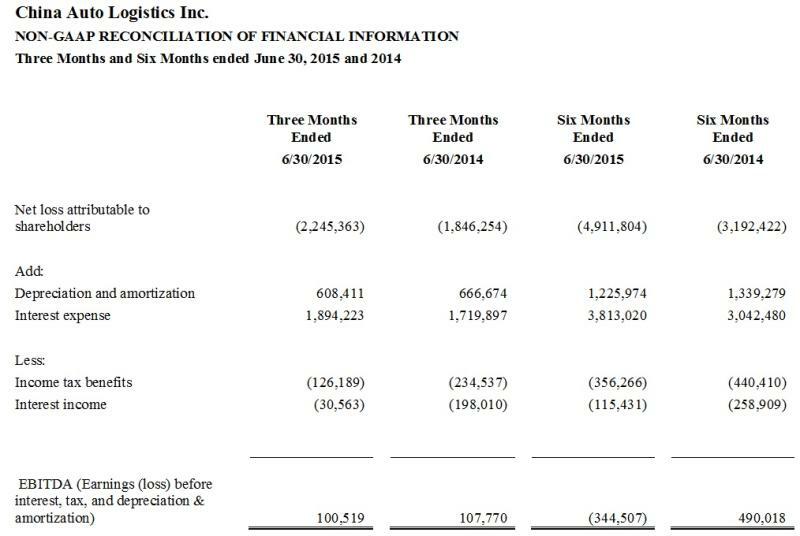 As of June 30, 2015 the Company had an accumulated deficit of $244,432 and a working capital deficit of $10,647,042. "We continue to operate in adverse economic conditions and are not currently generating sufficient cash to meet our needs over the next 12 months. However, we are continuing to push ahead to achieve our goals and believe we will be successful," Mr. Tong stated. He added, "Over the longer term, we continue to look at expansion of our retail luxury auto sales in conjunction with Tianjin Binhai and also see further possible growth in our used car sales JV. Our government has taken several steps to strengthen the economy and we believe that the results of this effort will become apparent in time." The Company will discuss 2015 second quarter and first half results during a live conference call and webcast on Thursday, August 20, at 8:00am ET.